Alan Burge spent many a happy year volunteering in the fondly remembered Amber & Black Shop. I have supported United for 47 years – a good few of them working voluntarily for the club. I started as a programme seller in the early 70s. I would collect my bagful of programmes and my dirty white cotton moneybag to put round my neck, then go and sell behind the Habbin. After a few years I started working in the Black & Amber Shop. There were five of us there: Andy Gilmour (shop manager), Ivan and Val Potter, Peter Spring and me. On match days we drove down Cut Throat Lane, through the big iron gates next to the old pools office and down the side of the pitch to the car park at the back of the main stand. Today’s big car park was still gardens back then. As you may recall, the shop was alongside the pitch where the main stand is now. It was of a kiosk-type design with strengthened glass windows on two sides, protected by big yellow plywood boards, which were locked from the inside when we closed. It started off as one section with the police box above, but another section was soon added on to the side. In the original section we sold all sorts of merchandise, from United and from all the top clubs: mugs, pennants, belts, stickers, sew-on badges, lapel badges, silk scarves and so on. In the second section we sold mainly programmes. These were on five shelves; a programme was pinned on the front with a pile of that particular edition behind it. We stayed open during the match and sat on the counter watching the game, still serving any customers who wanted to buy something. 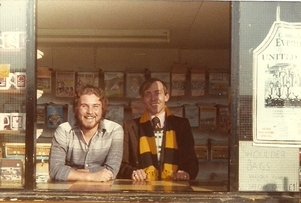 Dudley Arliss used to send boxes of unsold United programmes to dealers such as Steve Earl at Bungay, and in return he received an assortment of League club and international programmes. I once took the United minibus full of old programmes to Bungay and brought a similar number back. I remember Steve was in an old building like a village hall with piles of programmes all round the outside. After the game we tallied up the money and took it up to Dudley in the pools office. We would have a chat about the game and Dudley would often bring us out a bottle of beer each. About twice a season we would spend an evening stocktaking. The boxes of souvenirs were stored under the counters, and we used to get them all out on to the floor so they could be counted. We had a huge great box of CUFC belts that we could never sell – it seemed to be around for ever. I imagine the belts were dumped eventually. There were spin-off events from the Black & Amber Shop. One summer weekend there was a large fête-type occasion on Parker’s Piece and Andy, Pete, and I took the shop there. We had to pick up some trestle tables from a nearby building; I don't recall where, but I do remember they were damn heavy. I don’t know how much we sold that day, but we had a good time. Later in the day we got a football and started kicking it about. Pete told us he had been a great winger years before and kept showing us how he crossed the ball. That became a standing joke between us for years. When United ran a special train to Plymouth for an FA Cup match in 1977, we took the shop on the train. Andy and I walked up and down selling scarves and souvenirs. My big memory of this – apart from losing the game 1-0 – is that when we got back to the train everybody’s sandwiches, newspapers and suchlike had gone. Presumably the cleaners had cleared the lot. The Black & Amber Shop goods were still there, though. Every year the volunteers at the club were taken on a coach to the League Cup Final at Wembley. We used to stop at the Comet in Hatfield on the way for a beer, and again on the way back for a meal. After that we stopped at the British Legion in Royston before returning home, having had a great day out. They were great days, but when Dudley Arliss retired the magic seemed to go with him. John Carter took over and, although he did a good job, things weren't the same any more. 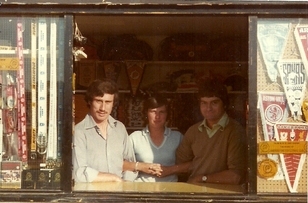 When the main stand extension was built we had to move the shop to various places – I can’t remember in which order. One was in the car park, and it had two doors and a long counter. It wasn’t there for very long if I remember right. During this time Pete and I went out and sold programmes at the bottom of the bridge on Newmarket Road. This was at a time when we were getting good crowds and it was non-stop selling. We never looked at anyone’s face, it was always ‘take the money, give the change, then on to the next hands’. Another location of the shop was behind the Habbin, right up the far corner. It sold next to nothing and didn’t last long. Then it was tried behind the pools office where the refreshments are now; it did OK, but nothing brilliant. The shop came to its final resting place just inside the gate by the Newmarket Road turnstiles. This is where we had our photo taken; I wished I hadn't put on a United beanie hat, as afterwards I thought it looked a bit daft. 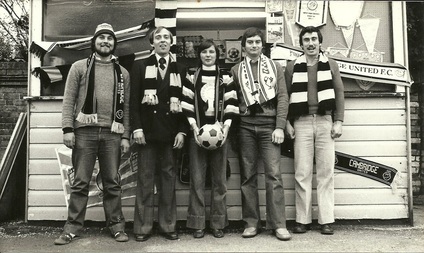 The photo was in the Luton programme a couple of weeks later (October 1980). We started to sell more souvenirs again, but the shop wasn't really big enough for the five of us and we started to go our separate ways. Eventually the shop was no more. Pete finished up working on the turnstiles and I spent a few seasons helping out on the pitch on match days. 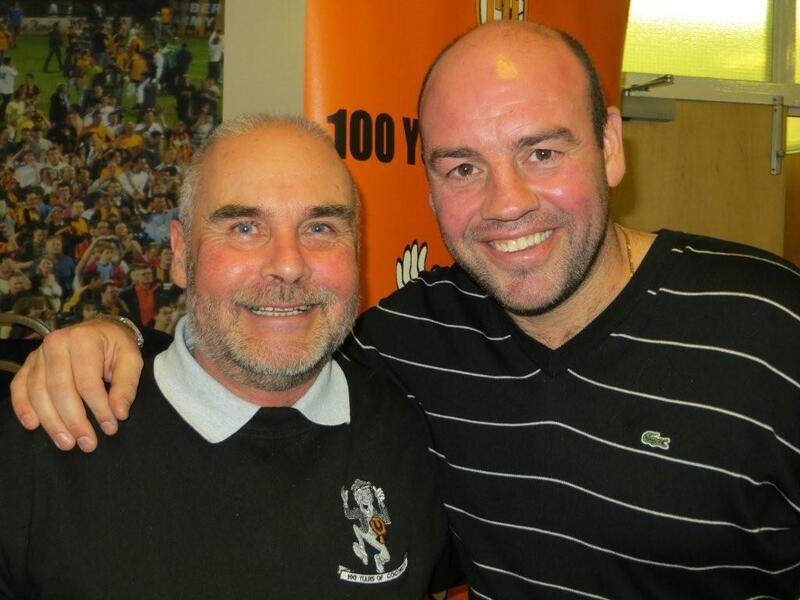 For me, the Amber & Black Shop days were the best at the club, although things have really picked up now. There was a special magic about the place and it was like one big family. Barry Benton was once a Chelsea supporter – or so he believed. 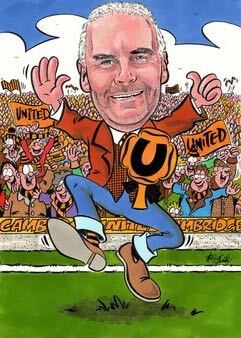 The first day of May in 1970 was the day the U’s changed my life for ever. My tenth birthday was still five months away. Chelsea had just lifted the FA Cup following an epic two-game encounter with Leeds United and, to all intents and purposes, I was a Chelsea fan. I’d watched the games on TV and had a newly hand-knitted blue and white bobble hat with the FA Cup around the sides, so I had to be. Two years earlier Chelsea had signed Ian Hutchinson from the U’s, with part of the deal being the promise of a friendly match. Knowing that I was football mad and a Chelsea ‘fan’, an employee of my father's somehow managed to secure a couple of tickets to witness the Cup being paraded and took me along to the Abbey for my first ever ‘live’ match. Pete ‘Noggin’ Stevens, you have much to answer for! My memories of the game are, unsurprisingly, somewhat sketchy – although I do seem to recall my feet not touching the ground in the packed corner of the Habbin adjacent to the Supporters’ Club. That’s probably not far from the truth as an all-time record crowd of 14,000 packed into the ground that night. For the record, Chelsea fielded a side containing nine members of the side who had lifted the cup, and they led 1-0 at half-time. With United due to play a crucial Southern League match against Margate the following day, they were replaced at the interval by Chelsea Reserves, who gave the seniors a good run for their money, the match ending 4-3. 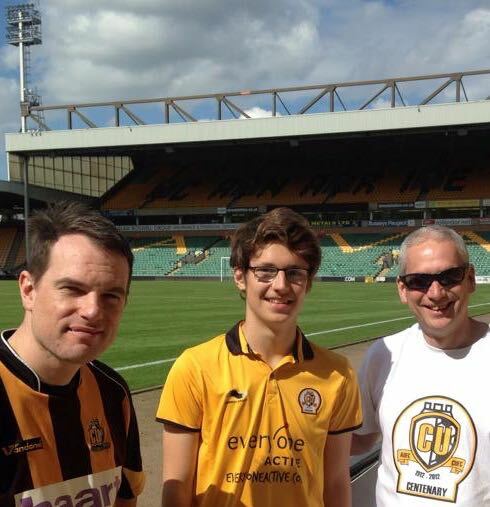 From that night on I was a Cambridge United fan. Forty-five years later I, along with my 15-year-old son, still follow this fantastic club through thick and thin, good times and bad. There have been some great highs during that time and also some low lows, but one thing is certain – my blood is amber. Cambridge till I die – and beyond!